Which industrial AC drive should I use? Picking the correct features of a Variable Frequency Drive for your particular application can leave you scratching your head. Here are 7 things to know and should consider when picking the right AC drive for your need. Your industrial AC drive supplies current to your motor and shut it on and off. Every time your motor shuts off and on, current will spike in your AC drive. Knowing your AC drive’s electrical current limit will ensure that the motor doesn’t burn itself or the AC drive out. It can also let your AC drive shut the motor off in the event the motor begins to draw too much current. The motor your AC drive operates will have a plate of information on it giving you the specs it needs an AC drive to have. Information like horsepower, torque, current draw and etc., are all displayed on the motor so it’s important to match the AC drive to the motor, not the overall system itself. The AC drive you choose will need to account for the duty cycle of its motor. If the motor is running nonstop or for extended periods of time, it will generate heat and begin to operate less efficiently or even burn up as a result. Picking the right AC drive with the right programming allows it to monitor the motor’s condition and mitigate the productive losses to a minimum. 4. Know what your industrial AC drive communicates with. Your AC drive needs to chat with other buddies besides the motor. As part of a larger, complete system, your AC drive may need to communicate with a Data Collection System (DCS) or Controlling System. These systems can PC-Based or controlled automatically by a Programmable Logic Controller (PLC). Knowing your systems communication protocol allows you to choose an AC drive with the same or even multiple communication protocols. 5. Know your AC drive’s control method. Your AC drive can be controlled using a variety of different methods. Depending on whether it will be a local, analog or digital control method, the AC drive will need to be set up differently. Each method requires different wiring and ports, so knowing this beforehand will make selecting an industrial AC drive easier. 6. Know the environmental conditions. An AC drive will likely operate under less-than-perfect conditions. Take into account how dusty its operating environment will be. How hot will it get? Is there moisture? Industrial AC drives can come built with an Ingress Protection rating, which will give it varying degrees of resistance to adverse conditions. You could also choose a housing cabinet that will protect a standard AC drive. 7. Know your available power. 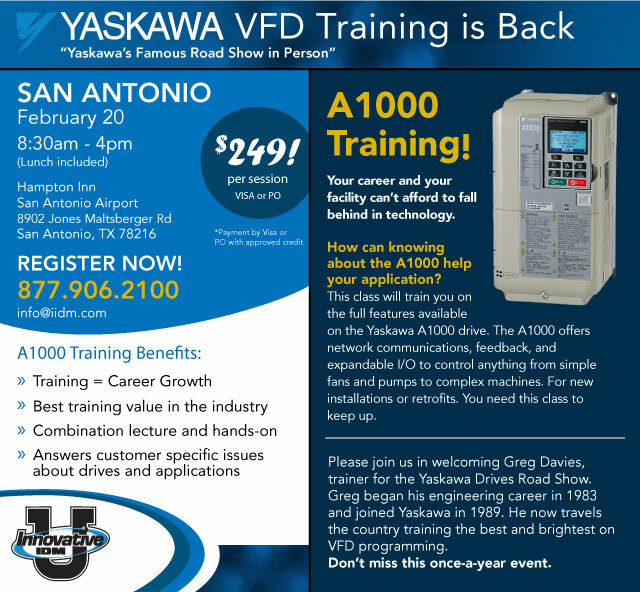 The Yaskawa Drives Roadshow is coming to San Antonio in February for A1000 training. Call us at 877.906.2100 or send us an email at marketing@iidm.com to reserve your seat today! This will be hands-on programming training on the A1000 drive. All drives, motors, equipment is provided. To see where the Yaskawa Drives Roadshow will be going next, check out our training page at innovativeidm.com/training. The Yaskawa Drives Roadshow is coming to Houston in February for A1000 training. Seats will go fast, reserve yours today! Two training dates to choose from! Click here for the full “Application Overview: Grinder” from Yaskawa. 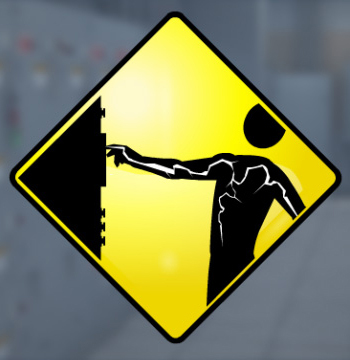 Heavy cutting is done at slow speed. With a constant wheel pressure on the material to be shaped, the pounds/minute of material removed, or work done, varies with the wheel speed. 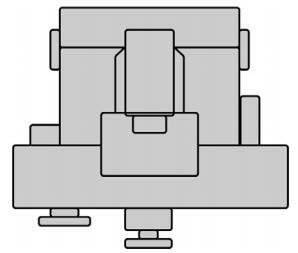 This is the constant torque part of the profile. After the heavy cutting is complete, a polishing (light cutting) operation is performed. A high speed, lighter wheel-to-material pressure is maintained; therefore, less material in pounds/minute is removed. This is the constant horsepower part of the load profile. Yaskawa AC drives have features that save energy, which allows the motor to run at optimal efficiency and precision when performing light grinding. Energy Saving Mode also reduces motor noise and stabilizes the load, perfecting the finishing process. Yaskawa AC drives can automatically detect changes to the amount of torque required during the shaping and finishing phases using Torque Detection. This feedback enables the drive to quickly detect changes as the grinding stone dulls or clogs. This can lead to significant cost savings by prolonging the life of grinding stones. Innovative-IDM is your #1 Yaskawa supplier. Call us today at 877.906.2100 or send us an email at info@iidm.com.